Sodium hydroxide storage tanks are manufactured from HDPE, XLPE, carbon steel, and FRP to 1.9 specific gravity. Secondary containment is required for bulk applications. NaOH is stable long term. Storing above 70°F is recommended for concentrated caustic to prevent freezing and promote fluidity. Tank capacities range from 35 to 100,000 gallons. Prices range from $300 to $150,000. Sodium hydroxide is an ionic compound made up of the positively charged sodium ion, Na+, and the negatively charged hydroxide ion, OH-, which derives the chemical formula: NaOH. Sodium hydroxide has a reactive and alkaline nature that contributes to its many applications. This inorganic, ionic compound is a strong base capable of increasing solution pH, buffer against pH changes, and drive pH-dependent chemical reactions. NaOH is also used for various other chemical processes, such as saponification in soap making. Common names for sodium hydroxide include caustic soda, lye, and its chemical formula NaOH. More obsolete and historical names are soda lye, white caustic, and sodium hydrate. As a white solid or a colorless solution, sodium hydroxide is an odorless, caustic chemical characterized by strongly alkaline corrosive properties, ingestion toxicity, reactivity with various chemicals, and incompatibility with certain metals. Due to its very real hazards, NaOH should always be stored and handled according to regulatory guidelines. As a solid, sodium hydroxide is a hygroscopic material and will readily absorb moisture and carbon dioxide from its environment as well as the oils found on human skin. Solid NaOH has a melting point and boiling point of approximately 604°F and 2534°F. Sodium hydroxide is less soluble in polar solvents such as methanol but is readily soluble in water up to a 50 wt% solution, which will have a pH around 14. The chemical solution of 50% NaOH is denser than water with a density around 1.52g/cm3 at 68°F. When dissolving solid NaOH in water or a strong acid, the ionic dissociation process can be violently exothermic, rapidly releasing significant heat energy. Upon ionic dissociation, free hydroxide ions, (OH-), will react with free protons, (H+), to form water and increase solution pH as H+ ions decrease and OH- ions begin to accumulate in excess. Sodium hydroxide has a characteristic viscosity that adds to its storage difficulties and chemical hazards. At 68°F (20°C), a 50% NaOH solution will have a viscosity rating around 78cp (centipoise; 1cp = 1mPas). For reference, water is around 1.0cp at this temperature and olive oil around 85cp. From its increased viscosity, liquid sodium hydroxide is a chemical prone to find or create leaks in its containment. It has been termed a "slippery" chemical due to its ability to find a leak path wherever one exists. How Should Sodium Hydroxide Be Stored? Caustic soda should be stored in containers that are resistant to the chemical’s corrosive nature. Secondary containment measures are required due to the "leak-seeking” nature and chemical dangers of NaOH. Methods should be utilized to maintain solution temperature above 70°F for both indoor and outdoor containers to ensure fluid viscosity and prevent precipitation (crystallization) of the solution. Snyder Industries, Inc. recommends using storage tanks with a 1.9 specific gravity capacity rating and equipped with PVC fittings, EPDM gaskets, and 316SS bolts. For plumbing to the tank, flexible connections with fittings and integrally molded flanges are recommended to help prevent leaks and extend service life in storage containers holding NaOH. Certain metals should be avoided when storing or transporting NaOH. These metals include aluminum, lead, tin, zinc, and the alloys of zinc such as brass and bronze. Galvanized steel should also be avoided due to the presence of zinc in the protective coating. Sodium hydroxide will chemically attack these metals, releasing them into the solution where the high pH and presence of water leads to the generation of flammable and explosive hydrogen gas. Carbon steel is recognized as generally safe for the handling and storing of NaOH, but will chemically attack this mild steel at elevated temperatures. Sodium hydroxide does not naturally form hazardous decomposition products, contribute to hazardous polymerization, nor express sensitivity to UV, and is considered a stable chemical. However, care should be made to avoid incompatible materials and their proximity to NaOH storage containers. Always communicate exact product needs and specifications to ensure storage tanks are capable of successfully storing the concentration of sodium hydroxide. Regular maintenance and inspection should always be performed on storage tanks to contribute to the container’s prospective service life. Sodium hydroxide is successfully stored in 1.9 specific gravity storage tanks of HDPE, XLPE, FRP, carbon steel and titanium. popular tank component materials include pvc/cpvc or 316ss for piping/fittings, epdm for gaskets, and 316ss bolts. other materials include: Hastelloy-c®, Ptfe, and pvdf. Storage temperatures for caustic tanks should be beneath 100°F for polyethylene tanks and beneath 120°F for carbon steel tanks. If these elevated temperatures are required, tank annealing and / or NaOH-resistant corrosion barrier coatings should be considered to counteract potential tank damage. Freezing point and naoh viscosity varies with concentration. concentrated sodium hydroxide is best stored at temperatures above 70°F to prevent freezing, caustic deposition, and promote fluidity through increased viscosity. Indoor storage is preferred due to temperature stability. If outdoor storage is required and regular ambient temperatures beneath 65°F are expected, consider utilizing more dilute NaOH solutions as freezing points are lower, and / or heated and insulated tank systems. Sodium hydroxide Tank heating can be achieved through heating tape, steam coils, or through internal heating with a nickel bayonet-type heat exchanger. A temperature controller should be installed to maintain solution temperature. Naoh storage and piping systems should include venting / overflow vents of diameters at least four times the fill line pipe diamter. sodium hydroxide tank systems should be designed to minimize piping runs, especially for outdoor applications due to naoh freezing concerns and solid deposition. Secondary containment measures are required for all NaOH storage conditions and must be engineered to contain 110% of total system volume. double walled tanks are effective in sodium hydroxide containment. bulk naoh storage containers should have chemical resistance and specifications verified. The different types of common tank materials are outlined below with relevant detail and comparisons concerning tank service life and estimated cost of tank system implementation. 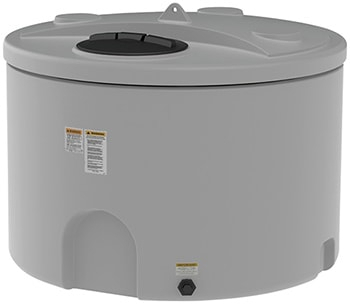 If considering an HDPE or XLPE tank option, you may request a quote for a sodium hydroxide tank that meets your requirements. High-density linear polyethylene (HDPE) and cross-linked polyethylene (XLPE) storage containers are perhaps the most cost effective variants that hold the potential for a 10-20 year service life. Both container types are capable of successfully storing NaOH. Recommendations are for storing caustic solutions in polyethylene storage tanks rated to 1.9 specific gravity and solution temperatures retained beneath 100°F. Schedule 80 PVC or CPVC fittings, EPDM gaskets, and stainless steel bolts are recommended sodium hydroxide storage tank component materials. Polypropylene tanks with polyurethane foam insulation and mastic coatings are approved for NaOH storage according to Grainger, Inc. that rates polypropylene with an “A” grade against all concentration strengths of the chemical. This claim is supported by Industrial Specialties Manufacturing that also gives polypropylene tanks an “A” grade rating at all concentration strengths at temperatures ranging from 68 to 212°F. Even though they can be more expensive than HDPE and XLPE, polypropylene tanks are supported as being more resistant to the corrosive effects of sodium hydroxide and potentially make good considerations for NaOH storage. The double-walled variants of HDPE and XLPE are more expensive than their single-walled counterparts, but the additional cost is made up for in the additional security of having a built-in secondary containment unit should a breach of the primary holding tank occur. A benefit of double-walled tanks is the execution of secondary containment in a more compact manner should space constraints be a concern. Another benefit of these tank types, should a release occur, is the ability for continued use until repairs can be performed, rather than immediately due to the chemical release from its containment. Double-walled tanks isolate the chemical in the situation of a spill with no threat to equipment, property, or personnel by providing a built in secondary containment system. Carbon steel tanks can be an effective choice for bulk caustic storage. Carbon steel tanks are considered compatible with most traditional NaOH concentrations. The effectiveness of carbon steel tanks begins to lessen at elevated temperatures, varying some with NaOH strength. At 50% concentration, carbon steel tanks begin to experience elevated stress corrosion cracking at temperatures in excess of 120°F (49°C). The temperature this begins to occur decreases in a non-linear manner as concentration decreases, maximizing to near 180°F (82°C) for 1% NaOH solutions. When such elevated solution temperatures are expected, carbon steel tanks should be annealed to increase structural durability. Carbon steel sodium hydroxide tanks can be lined with natural rubber as an extra measure against corrosion and are recommended when iron pickup by the NaOH solution is a concern. The rubber lining will be resistant to the corrosive effects of NaOH as long as it is natural rubber. With a resistant natural rubber lining, carbon steel tanks can be largely resistant to the corrosive effects of NaOH, making them good potential choices for sodium hydroxide containment. Sodium hydroxide solutions are not considered immediately compatible with fiberglass-reinforced plastic (FRP) tanks as caustic soda corrosively attacks the glass fibers that comprise the tank, which can lead to tank failure and containment breach. To store NaOH in FRP tanks, synthetic surface veils and effective corrosion barriers are required for successful storage. Selection of an FRP tank and appropriate construction materials should be readily discussed with the manufacturer to ensure a capable and safe storage scenario for bulk NaOH. Titanium is a metal largely resistant to sodium hydroxide’s corrosive activities. Containers made of titanium hold the greatest cost and greatest service life capabilities up to and beyond 30 years. Due to the high cost of bulk titanium tanks, these storage containers are most commonly recommended and reserved for high-throughput situations where containment failure and manufacturing down-time cannot be a consideration. All caustic storage facilities must consider spill containment for storage tank systems. Successful containment can be achieved through the use of sumps or reservoirs, spill containment tanks or basins, double walled tanks, or by diking through concrete applications. Engineering safety protocols require that secondary containment be capable of retaining at least 110% of the tank system total volume. Double-walled tanks can be effective secondary containment systems by encapsulating leaks between the external and internal walls should a chemical breach occur. Double-walled tanks are designed to retain 110% of the tank volume and to allow continued usage of the storage tank despite the leak. Poured concrete diking can be an effective means of secondary containment for bulk NaOH storage. Most materials are not fully inert or resistant to chemical leaching, even if the effects are minor. Paints or other types of sealing liners can be applied to concrete settings which will increase concrete’s resistance to caustic soda. Laws and regulations may stipulate NaOH secondary containment systems, installation, and upkeep maintenance. Always verify chemical storage systems are designed and maintained according to regulating law codes. Successful storage of sodium hydroxide is similar for its solid or liquid form when considering storage containers resistant to its corrosive capabilities. Due to physical and chemical characteristic differences, solid and liquid forms of NaOH each have their own unique storage considerations. In its solid form, NaOH should be stored in airtight containers with limited atmospheric exposure to avoid water and/or CO2 adsorption. With solid NaOH, there are two extra considerations due to its hygroscopic nature and the potential of this contamination. First, water absorption will slowly create an aqueous solution where the presence of water can allow for the chemical attacking of the storage container in a manner not previously afforded by the solid and therefore the container must be fully resistant to a NaOH solution as well. Second, the absorption of CO2 is a chemically-altering reaction similar to a decomposition reaction that converts NaOH into sodium carbonate, Na2CO3, reducing the percentage/purity of NaOH. 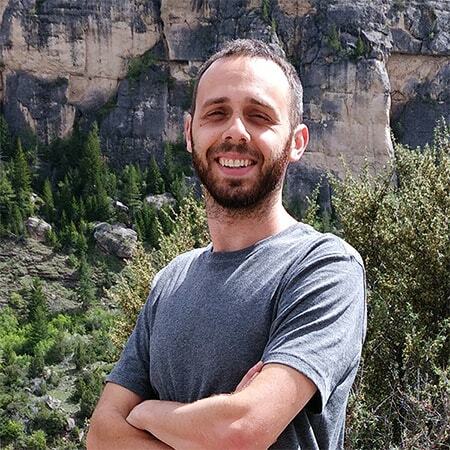 This ability of NaOH to absorb CO2from the atmosphere drives its applications within power plants for the “scrubbing” of unwanted gaseous byproducts. In the storage of liquid NaOH, the ability to maintain the solution’s temperature and correlating viscosity is generally considered a requirement of large-scale store and use. To aid in temperature maintenance, containers equipped with heat tracing and insulation are recommended for many applications. 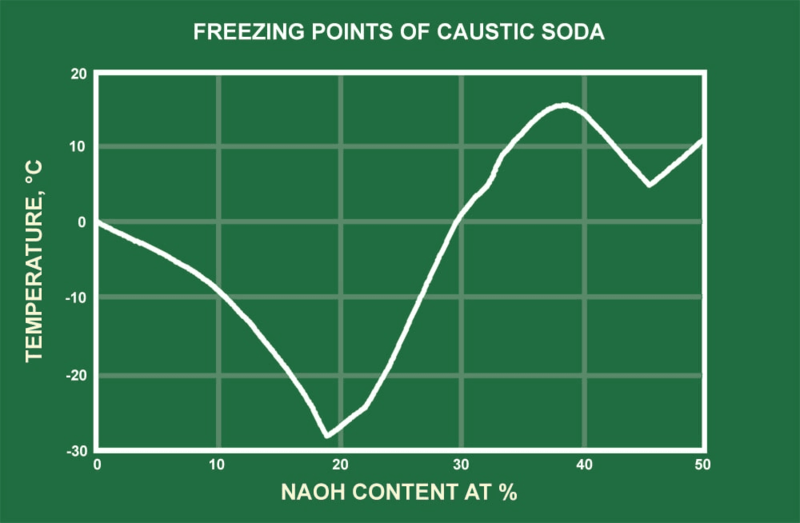 As demonstrated in the freezing point curve graph for sodium hydroxide at various concentrations, the solution’s freezing point can vary markedly. As the solution temperatures fall and near the freezing point, NaOH can begin to crystallize (precipitate) out of solution, which can cause buildup of the solid within storage containers, pumps, or piping. Precipitation occurs when a chemical element dissolved in solution comes out of solution to its solid state. This is due to conducive environmental conditions such as temperature, pressure, solution concentration, and other chemicals present in the solution. The viscosity of sodium hydroxide is strongly temperature dependent. When the temperature begins to fall below around 80°F, the solution’s viscosity begins to increase markedly, especially at stronger concentrations. The graphical representation of NaOH’s dynamic viscosity demonstrates the solution will be more viscous for greater NaOH concentrations and depicts how the viscosity begins to rise as temperatures decrease. This increase in viscosity is actually of great concern when NaOH is used in industrial settings where large quantities are stored and the solution is pumped to utilization areas. If sodium hydroxide solutions become too viscous it can actually contribute to equipment malfunctions, pump failures, and accumulation of solids. The Dow Chemical Company has recommended keeping the storage temperature of NaOH in the range of 85 to 100°F as the viscosity of solutions at this temperature should retain fluidity and functionality. As with most bulk chemical storage scenarios, NaOH storage tanks require or benefit from certain piping and tank venting considerations. Snyder Industries, Inc. recommends the use of flexible connections with fittings that allow for a 4% tank expansion and contraction both laterally and vertically. Flexible connections and fittings will reduce vibration stress on fittings, gaskets, and the tank due to pumps and associated piping. Sodium hydroxide solutions can freeze at temperatures beneath 60°F (15.5°C), depending upon NaOH concentration, which can cause release and buildup of solid NaOH. Due to this relatively high freezing point of caustic soda solutions, pipes used in process flow are recommended to be insulated and heat traced. These recommendations are applicable should piping runs be exposed to ambient temperatures beneath 65°F (18°C), even if duration is limited. Sodium hydroxide tank systems should be designed and operate at atmospheric pressure. Tank vents should remain open and should be of sufficient size to prevent pressure concerns, traditionally the recommendation is for at least four times the cross-section area of the fill line. The Dow Chemical Company, Dow Chlor-Alkali and Vinyl division, makes these statements, and the recommendation to extend the vent pipe from the top of the tank to near ground level so the vent pipe doubles as an overflow. The density rating, viscosity, and freezing points of various sodium hydroxide concentrations are important characteristics to consider in successful bulk NaOH storage and applications. The following table chart reports sodium hydroxide density across concentration and temperature. The viscosity and freezing / boiling points of the NaOH concentrations are also included for reference and to demonstrate the importance of these physical properties of sodium hydroxide in bulk storage, its use, and how these values can change based on solution strength. Sodium hydroxide has chemical properties, reactivity, and incompatibilities that must be considered during its handling and storage. The chemical nature of NaOH allows it to be reactive and/or incompatible with metals, oxidizers, some nitrogen-containing compounds, and a variety of other chemicals (organohalogens, ex.). Sodium hydroxide also drives the soap making process known as saponification. Saponification is the base-driven hydrolysis of animal fat/vegetable oil triglycerides to yield a fatty acid salt called a soap, which in the example is sodium palmitate. This reaction depicts the reason NaOH is used in soap production. In the reaction, NaOH removes a functional group from the ester of the triglyceride, altering its chemical structure. The figure depicts the saponification/hydrolysis of a triglyceride by NaOH. The ester group is separated at the single carbon and single-bonded oxygen, releasing the individual carbon chain backbones to bond with the sodium ions from NaOH and form the soap sodium palmitate. This reaction also releases the “head” group to bond with the hydroxyl ions of NaOH to form a glycerol molecule. The saponification process is a relevant concept in NaOH safety as the process begins upon contact with skin. There will be a “soapy” feel as skin tissue oils are saponified due to the corrosive activities taking place. Contact needs to be washed off immediately to avoid continued corrosive damage. Sodium hydroxide is considered stable in normal conditions of use. NaOH is incompatible with the metals aluminum, tin, and zinc, as well as their alloys, and the reaction with these metals can drive the production of flammable and potentially explosive hydrogen gas and should be avoided. NaOH’s chemical reaction with aluminum is reported as being particularly vigorous and hazardous. 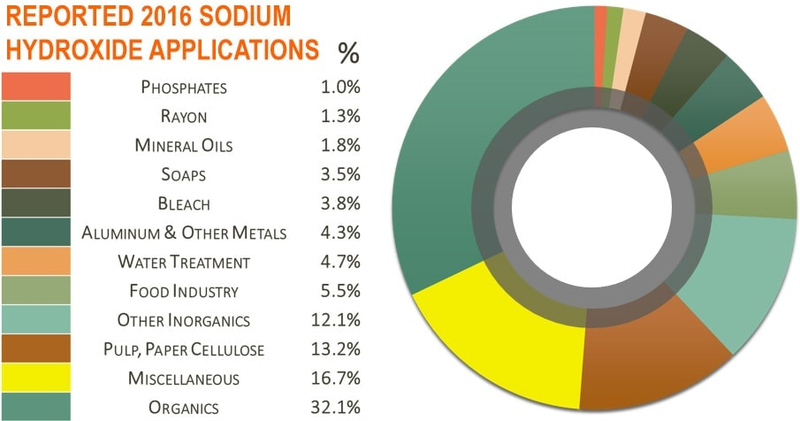 Sodium hydroxide can be a very reactive chemical and is incompatible with certain strong oxidizers due to the potential for high energy reactions. Examples of incompatible oxidizers include, but are not limited to: per chlorates, peroxides, and certain nitrogen-containing compounds such as ammonia. The reaction from mixing of sodium hydroxide and hydrogen peroxide, H2O2, yields sodium peroxide—a strong oxidizer. This reaction can be violently exothermic and produce a heated mist capable of causing severe burns. Sodium Hydroxide should be considered incompatible with other substances and materials until proven otherwise. A few examples include: bromine, nitroaromic, and organohalogen compounds that can produce a potentially explosive product upon mixing with NaOH. Acetic acid, when adding NaOH, can react violently or ignite under certain conditions of temperature and pressure. Reactions with sugar solutions, such as lactose and fructose, can cause NaOH to produce hazardous carbon monoxide. Millions of tons of NaOH are manufactured annually for its worldwide use across industries. Sodium hydroxide is used in the production of textiles, rayon, cellophane, soaps, detergents, sodium salts, and for its uses in bauxite ore refining to aluminum, pH regulation, chemical synthesis reactions, electroplating, and etching. It is also used in cleaning, sanitization, and grease removal. In the food industry, NaOH is reportedly utilized to chemically wash and peel certain vegetables and fruits. Drain cleaners such as Drano®, oven cleaners, heavy-duty degreasers, and bleach are some common household products that will contain sodium hydroxide. In specific chemical reactions, sodium hydroxide is used to react with toxic oxides that are produced in the burning of coal from power plants. These oxides are carbon dioxide, CO2, sulfur dioxide, SO2, and dihydrogen sulfide, H2S. NaOH reduces the oxide to form a salt and water, as exemplified below. NaOH is also effective in removing, inactivating, and/or dissolving proteins, nucleic acids, end toxins, viruses, bacteria, yeasts, fungi, grease, oil, and fats. Chlorine, typically from table salt, (NaCl), enhances the sanitizing and hydrolyzing capabilities of NaOH quite effectively. Sodium hydroxide is used extensively in protein removal from ion exchange and gel filtration media, and in the cleaning, sanitizing, and storing of various chromatographic media, equipment, and systems. Reports of industrial applications indicate the benefits and advantages of using sodium hydroxide to be: low cost, overall efficacy, and easy detection, removal—as from solutions—and disposal. There are over 20 chemical manufacturers in the United States that reportedly produce sodium hydroxide. The most common NaOH manufacturing method is the Chlor-Alkali Process. The Chlor-Alkali Process is the electrolysis of a NaCl brine solution to produce NaOH with hydrogen gas and chlorine gas generated as byproducts. Three equipment systems exist: the mercury cell, membrane cell, and diaphragm cell, and each produces a corresponding grade of caustic soda. Diaphragm Grade – 50% NaOH plus 1% NaCl. Membrane grade is more valuable and cost-effective. 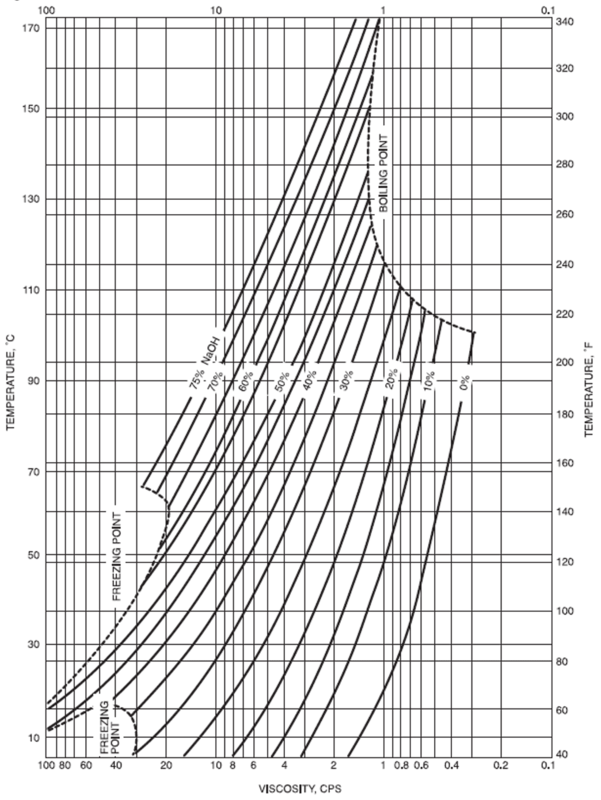 Diaphragm grade is the cheapest grade and often used in pH adjustment scenarios.The mercury system is being replaced across industries due to the amount of mercury waste generated. The membrane and diaphragm cell systems are the same except for the permeable filter separating the two compartments. The diaphragm system is less common than the membrane system and traditionally uses a diaphragm of asbestos fibers that is permeable to the brine solution but prevents the formulated NaOH from reacting with the chlorine gas. 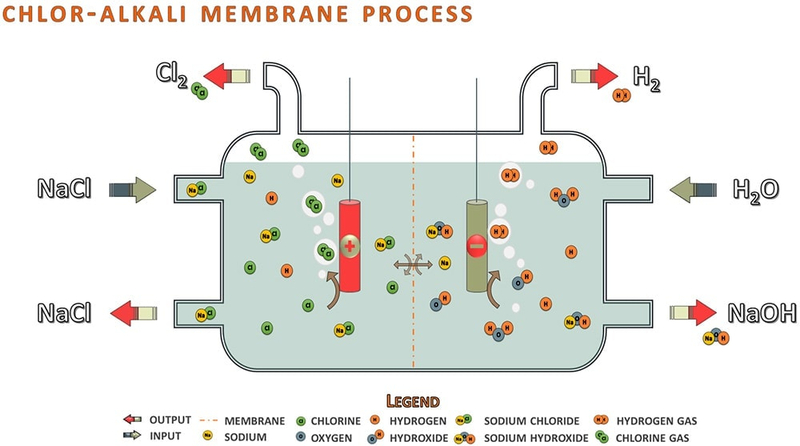 In a membrane cell, an ion-permeable membrane separates the two compartments and allows free sodium ions alone to enter the second chamber to react with hydroxide ions to yield sodium hydroxide. This method allows less NaCl to be present in the NaOH product chamber when compared to the diaphragm method. Sodium hydroxide is a corrosive chemical, hazardous and toxic, that functions in a wide array of industry processes around the world. Chemically, NaOH is incompatible with specific metals, can have potentially violent reactions with a variety of compounds, and is capable of causing severe caustic damage. Sodium hydroxide is used across the textile, detergent, chemical, and food industries for its abilities to affect pH, drive chemical reactions, and to clean and sanitize. NaOH has a characteristic viscosity that makes the chemical prone to finding leak-paths. In the storing of toxic and dangerously corrosive chemicals like sodium hydroxide, always follow federally-mandated guidelines and regulations. Communicate your exact chemical needs before purchase and use of a sodium hydroxide tank as chemical storage tank specifications can vary across manufacturers, across tank materials, and for different solution strengths. Consistently verify that potential storage tank and secondary containment measures are fully capable of holding the desired sodium hydroxide strength. A storage container should be fully evaluated to ensure it will reliably and safely contain this leak-seeking, caustic chemical. When handling NaOH, federal safety guidelines should be followed at all times, (for further safety and hazard information—for solid NaOH: see the CDC; and for NaOH solution: see CAMEO Chemicals, a division of the National Oceanic and Atmospheric Administration (NOAA)). If you need assistance or would like more information concerning sodium hydroxide polyethylene tanks or secondary containment options, Protank welcomes you to contact us. We work directly with the top sodium hydroxide manufacturers in the United States and will work directly with you for a solution to all your chemical storage needs.